Down and Out Chic: My stationary needs a suitcase. My stationary needs a suitcase. So, I've had a slight obsession with paper products lately (slight) as evidenced by these previous posts. My collection is steadily growing with my latest pieces being a few cards from this ahh-dorable etsy shop. So, the question now is where do I put all these lovely, well designed paper goods? Currently they're stuffed in a desk drawer or they're mingling with the craft supplies, either way they're not housed well. Well, I think my search might be over. 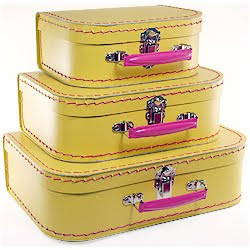 That's right, paper suitcases from Pink Loves Brown (just re-opened!). These beauties come in three sizes, perfect for holding photos, stationary, cards, decorative paper, old love letters (if you're the angsty type), etc. Best part is, they range from $11.50-$14.50 so you don't have spend much to carry that stationary in style. Oh wow, these are so cool! I'm totally torn between the pink and the yellow. What an ingenious (and adorable) way to store one's papers and letters! My...we have the same taste! these are awesome! thanks for the link! These are so perfect I need one! I saw these the other day! They are so cute!! 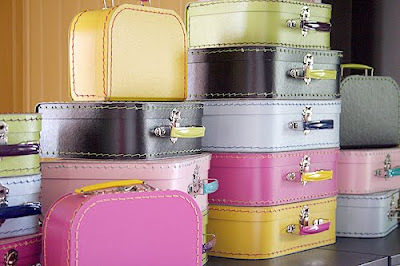 Thats funny because I have a slight obsession with Vintage Suitcases!! Weird. These are great! These are fabulous... Could you pick one of each color?? so cute!!! so functional!!! AND THE PRICE IS RIGHT!!!!! Why do I have a weakness for suitcases? It has to be the promise of adventure rather than the actual use. 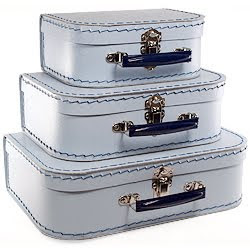 I bought a really nice (designer) luggage set a few years ago and am filled with regret: I worry every time I travel with it! BUT - these will be safe at home. PaperSource always has fun little cases too. They would also make adorable playroom storage (one for dolly's hats, one for the princess dresses, etc.). I love these, I have had one in gold for quite a while and keep finding new ways to use it! For sure a versatile fun gift! We used these for our wedding in the kids area. They are super cute in person. I say yellow! I am SO all over these - AWESOME find! i'm embarrassed to mention my stationery has gotten out of hand, i need two dressers. i wouldn't feel so bad if i actually used them! oy. i bought one from the card store and pilled it with cards...poor paper suitcase. I absolutely love them! I want them in pink!!! ;O) They could really help keeping my stuff in order heheheeee!!! omg, these are absolutely adorable!! I'm loving the pink. i have had an eye on these for some time now. Just love them. Even tho I produce and design paper goods, I love to buy other peoples lovely work! What can I say? These are the cutest things ever! Love the pale blue ones! You are a goddess, I must have them! Love these! I have the same problem--my stationery is ALL over the place and of course ends up getting crinkled and ruined. these are so adorable! Oh love the yellow and pink! Adorable. Um, gorgeous. I vote for one of each! That's such a cute idea! and it looks pretty in a room! that's what i call efficiency! so cute! I found a bunch of little suitcases that were my Nana's, one had her bathing suit (circa 1950's) swimming cap, and a towel all ready to go for a quick trip to the beach!! I still have it all packed up like she did :) Using them for stationary is such a great idea though! These are absolutely divine!! !I have been looking for a set like this for a gift and these are perfect! I would have to have the pink ones...not just because they are pink, but I love how the bright turquoise punch of color contrasts with it. Just adorable! ahhh! those are all so cute! what a neat idea! So cute! I have a pink and green polka-dot one from Layer Cake, I think. I keep fabric remnants in it. Those would be perfect in my dream home office. LOVE! those are adorable...I need a place for old photos! Adorable! Yellow and pink please. These may be the cutest thing ever, when you get yours we must see pics of the organizational effort! So much more fun than a shoebox. Reminds me of the little suitcase I'd take when spending the night at grandma's.